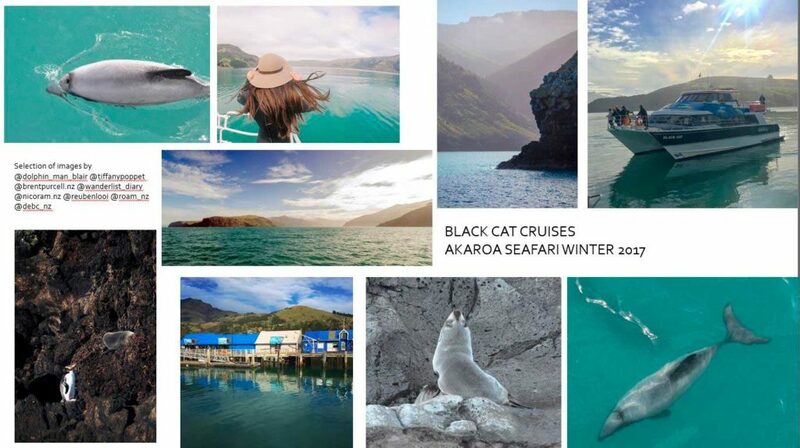 Black Cat Cruises challenged awesome New Zealand based photographers to come out with us mid-winter to get the most epic Winter Seafari shot from both our Akaroa Harbour Nature Cruise and Swimming With Dolphins experience. Both tours operate all year round and whilst the weather gets colder in the winter the wildlife and scenery remain just as beautiful and abundant! Fantastic wildlife and landscape images from in and around Akaroa harbour were produced from the day. These were then uploaded to the Black Cat Cruises website. These images are open for the public to vote on their favourite shot…..in return you could win yourself a trip out in Akaroa with us on either our Akaroa Harbour Nature Cruise of Swimming With Dolphins experience! Who Attended The Akaroa Seafari? We had a fabulous turn out of photographers, all of whom have a presence on Instagram. Photographer’s even flew in from the north island (a special shout out to @brentpurcell.nz and @debc_nz) to be with us, along with the Department of Conservation’s Threatended Species Ambassador @doctsambassador, Marine Biologist @dolphin_man_blair and @Christchurchnz very own Digital Manager. These guys along with all of our other wonderful guests have done a tremendous job in helping to share this story and hit our fundraising target. Between the group that came out with us on the day they had a network of over 250,0000 followers. They instantly became fantastic ambassadors photographing, sharing and even documenting their experience of the Akaroa Seafari. Click through to the competition page to see their top shots from the day. Each image has the photographers instagram handle assigned to it so you can click through and see their page. We are encouraging everyone to vote for their favourite image to go in with a chance of winning either an Akaroa Harbour Nature Cruise or Swimming With Dolphins experience. Whilst voting is still open and in it’s final few days, we had pledged that for every vote we would donate $1 to the New Zealand Whale and Dolphin Trust, up to $1,000 and we are so pleased to say that the target was hit within just a few weeks. You can find us by searching @blackcatcruises…or simply click on the link here. We share photographs from all over the peninsula and we’d love to see yours! Just tag us #blackcatcruises in your pics for your chance to be featured. If you want to attend one of our future events drop us a line and say hello! We’d love to hear from you…. Check out the black cat cruises website for a full listing of all the Seafari Akaroa images and to vote for your favourite!